The Phospho-MEK1 (Ser218/222) kit enables the cell-based detection of MEK1 protein phosphorylated at Ser218/222 when studying the RAS-RAF-MEK cascade in the MAPK/ERK pathway. The Phospho-MEK1 (Ser218/222) kit measures endogenous MEK1 protein phosphorylated at Ser218/222 when studying the RAS-RAF-MEK cascade in the MAPK/ERK pathway. Phosphorylated by RAF, this dual specificity mitogen-activated protein kinase is responsible for the phosphorylation of ERK, one of the most important signaling nodes, and protein kinase in cell proliferation, survival, and differentiation pathways. The Phospho-MEK1 (Ser218/222) assay measures MEK1 when phosphorylated at Ser218/222. Contrary to Western Blot, the assay is entirely plate-based and does not require gels, electrophoresis or transfer. The Phospho-MEK1 (Ser218/222) assay uses 2 labeled antibodies: one with a donor fluorophore, the other one with an acceptor. The first antibody is selected for its specific binding to the phosphorylated motif on the protein, the second for its ability to recognize the protein independent of its phosphorylation state. Protein phosphorylation enables an immune-complex formation involving both labeled antibodies and which brings the donor fluorophore into close proximity to the acceptor, thereby generating a FRET signal. Its intensity is directly proportional to the concentration of phosphorylated protein present in the sample, and provides a means of assessing the proteins phosphorylation state under a no-wash assay format. The 2 plate protocol involves culturing cells in a 96-well plate before lysis then transferring lysates to a 384-well low volume detection plate before adding Phospho-MEK1 (Ser218/222) HTRF detection reagents. This protocol enables the cells' viability and confluence to be monitored. Detection of Phosphorylated MEK1 (Ser218/222) with HTRF reagents can be performed in a single plate used for culturing, stimulation and lysis. No washing steps are required. This HTS designed protocol enables miniaturization while maintaining robust HTRF quality. HeLa cells were grown in a T175 flask 37°C, 5% Co2, 2 days. Stimulation was done with EGF 2nM for 5 min. After removal of cell culture medium, 3 mL of supplemented lysis buffer were added and incubated for 30 min. Soluble supernatants were collected after 10 min centrifuging. Equal amounts of lysates were used for a side by side comparison of WB and HTRF. 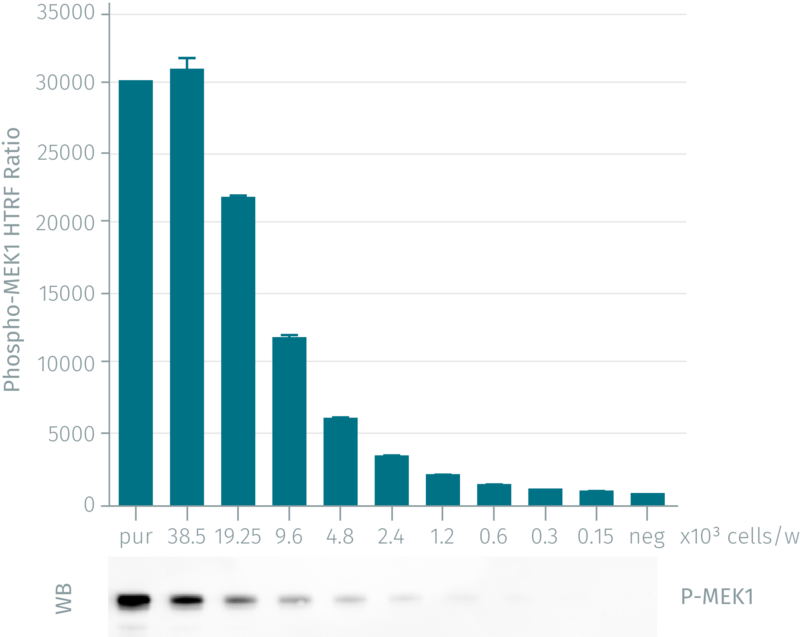 Phospho-MEK1 assay shows the same level of sensitivity as Western Blot. Murine NIH 3T3 cells (25,000 cells/well) were stimulated for 15 minutes at 37°C with various concentrations of PMA. After a 30 minutess lysis incubation time, phosphorylated MEK1 were measured using the two-plate assay protocol. HeLa cells (50,000 cells/well) were incubated for 15 min at 37°C with various concentrations of the 2 inhibitors, Erlotinib (the EGFR inhibitor) and L777,450 (a Raf inhibitor). EGF 0.8nM (agonist) was then added and incubated for 10 minutes. After a 30 minutess lysis incubation time, inhibition of the phosphorylated MEK was measured using the Phospho-MEK1 assay. Assay was done using the two-plate assay protocol.